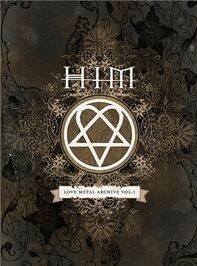 These days bands often release a DVD with their 2nd or 3rd album, HIM waited almost a decade til they released Love Metal Archives Vol. 1. The menu is dubbed with some piano - very nice. Also the visual effects are nice. But what‘s most important? The music! The Finnish present all their video clips at this DVD and it becomes obvious that the band partly did different versions and so you might be surprised by a clip you don‘t know. The sound quality is good, but still the old 2.0 standard and not the up-to-date 5.1 dolby sound. But I doubt that everybody has a 5.1 doldy surround sound, so this might not effect all fans. But in future they should try to keep up with modern quality standards. Additionally to the live stuff - taken at different tours and festivals - the fans get the first video clip version of Wicked Game, an unplugged version of Join Me In Death and a cover version of Billy Idol‘s Rebel Yell. You can watch HIM play at different stages of their career and show them playing at a hotel in Turku / Finland as well as at Rock am Ring where they played in front of thousands in 2001. These days every DVD offers a biography and a photo gallery, so does this one. Some interviews are added and show the unique humour of the Finnish. Its really fun to listen to the interviews and you can enjoy this not just once. The double DVD offers a lot of HIM and is really value for money. But make sure you have enough time to watch, coz at all it‘s more then 5 hours! Extras: Photo gallery, biography, interviews, etc. Dark Light is the 6th album of the Finnish goth rockers and again there will be critics and lovers of their sound. As usual first came the single Wings Of A Butterfly which is a catchy track. 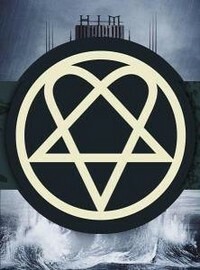 But the album kicks off with the slow tune Vampire Heart. A melancholy song which takes time to get into. But then the guitar riff-based song Wings Of A Butterfly comes along with a catchy hookline. The voice of Ville Valo is melancholy, but powerful. Perhaps a bit heavier then the last one, but still with a touch of pop... Commercial? Well... Yes, but they just stick to their roots. Guitar rock with melancholy lyrics and great, sad melodies. Even if Under The Rose is almost happy... A bittersweet rocker. Here not the guitar riffing is carrying the song, instead keyboarder Burton is creating a bittersweet atmosphere. In the middle part guitarist Linde step up-front riffing and with a short solo. Will this be the next single? Perhaps... It's catchy... And stands out from the rest of the charts anyway. Or will the band / label choose Killing Loneliness? An up-tempo song with dreamy lyrics. In contrast to the rock guitar riffs you hear some violines... At the end reduced to vocals and guitar. Then it's time for the title track Dark Light. Here Mr. Valo tells the story of a 12 year old girl who lived in the 16. century - the dark age. The pestilence got her and she gets to a special place. There she started to search for God or whatever will help her to die in peace. Dark and atmospheric, but also a bit cheesy... Usually Ville tries to keep the lyrics a bit more mysterious. So that the fans can read into it their own interpretation. Here he just tells a story. The Face Of God is a heavy gothic rock song, at least that's what you expect after the first notes. But that's too easy! HIM try to surprise the listener and so breaks, changes drag you into the HIM universe. Ville sometimes melancholy, then very hypnotic. Putting you under a spell. Pleading, slightly distorted vocals... All that you can find on Dark Light and partly even in one song! With Play Dead they present a ballad... Really heavy with orchestral keyboard parts and vocals full of grief. Last, but not least the opus In The Nightside Of Eden. An up-tempo song with a more positive vibe, screaming guitar riffs and a heavy groove. The refrain is catchy and Ville's hypnotic voice is spellbinding. A great album which will meet the expectations of their fans. And again they survived the walk on the razor's edge between heavy rock and bittersweet melodies. Between catchiness and originality.